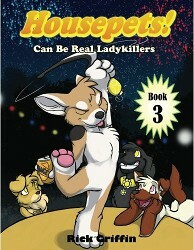 The Guest of Honor for this flight is test subject Rick Griffin, known for his online comic Housepets!. He will be present for panels and other artist related events. Please check out his works (reviewed on Flayrah). To be a part of this historic launch, you will need to join ranks with us some time soon - stay tuned for when. There will be other entertainment also. The Furry Drama Show returns with new music and videos. As always, they (Wilfred Brimley, err . . . Keefur) will be looking forward to your acts. We are looking for skits of comedy, Dancing, singing and stand up comedy. You can also submit videos. No performance should exceed 3 minutes. (Furries have short attention spans, you know). Are you looking for an extra space rock or perhaps leftover Space Shuttle parts? You won't find them here, but we might fill out your collection with other unusual items brought from all over the US of A. and put together in one space for your convenience. There are also those who might have space rocks to sell; not likely, but if wish to be a dealer you may contact Mission Control Officer Yoken. Opportunities abound in the Space Market! Hundreds of skilled jobs are being offered in the Space exploration market here at RCFM. Well, maybe not hundreds, but a lot. We need leadership and staff in registering hundreds (really) of tourists to our complex, and handling Artists Alley, Con Book, Marketing, and the Newsletter as well. If you are interested, contact Snap E. Tiger - or better yet, email your interest today! Let him know what you are interested in as well as any experience you may have. More news to come as updates come in . . . The original author might want to consider toning down the theming of the text for readability's sake. The first paragraph, though clear in retrospect, took me a minute to figure out at first. This was our first Newsletter attempt for the 2013 convention, so it might be considered a "prototype" and a few bits of awkwardness are just to be expected.